You may have seen recently that scientists recovered and “revived” a giant virus from Siberian permafrost (frozen soil) that dates back 30,000 years. The researchers raised concerns that drilling in the permafrost may expose us to many more pathogenic viruses. Should we be worried about being infected from the past? Can human viruses survive in this permafrost environment and come back to wreak havoc? First, we need to examine the properties of viruses. Not only is the recently-discovered virus old, but it is extremely large. Viruses are normally so small that between 5,000 and 100,000, placed side by side, would only measure 1mm. An ultrathin section of a Pithovirus particle in an infected Acanthamoeba castellanii cell. But this giant virus is about 10 times larger, and only around 500 would fit in 1mm. 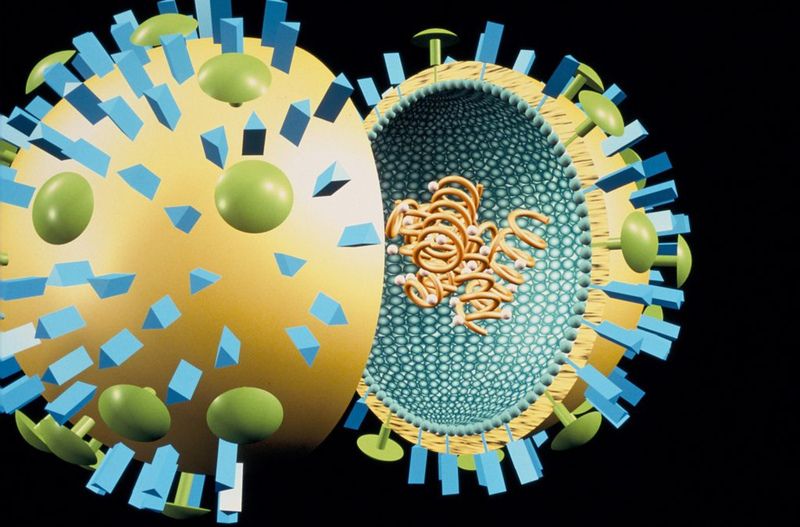 The virus is elongated with a fringe around the outside, and a novel geometric hexagonal like “cork” structure at one end. 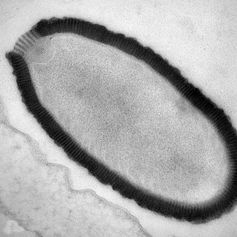 It was named Pithovirus siberica, based on the Greek word pithos for a large storage container for wine or food. Viruses themselves are not alive, but in order to reproduce, viruses need to infect a live host. Usually viruses can only infect a specific type of host, which may be bacteria, protozoa, plants, animals or humans – only rarely does the same virus infect more than one species. The scientists had previously found similar large viruses from water. Those viruses infected amoeba, a simple single-celled organism. When looking for large viruses in the permafrost they thought amoeba would again be a likely host, so they mixed the permafrost soil samples with amoeba, and saw the amoeba dying, indicating that they were infected with the ancient virus. Simplistically, a virus is like a bag of genes. The genes contain the necessary information to make thousands of copies of that virus once it enters the host cell. Most viruses are very unstable outside their host, lasting only a few hours to a few days in the environment. In addition to UV exposure, the drier and warmer it is, the faster their loss of viability. If the virus does not find a new host to infect fairly rapidly it will degrade, and no longer be infectious. Because viruses are fragile, they’re normally stored frozen at -70C in laboratories, but they also need to be rapidly frozen and rapidly thawed to stop them degrading. Even at -20C they are not stable, so in the permafrost environment they are likely to have been exposed to drying conditions prior to freezing, and possibly multiple cycles of slowly freezing and thawing, which would also lead to degradation of many viruses. Not only do viruses infect specific hosts, but even their means of entry into that host is specific. Some viruses infect by the respiratory route, some via ingestion and others by direct contact with bodily fluids. For a virus to infect us from this ancient permafrost they would need to infect us by the correct route. It is more likely that a virus posing any threat to humans would be found protected in a mummified body rather than in the environment. 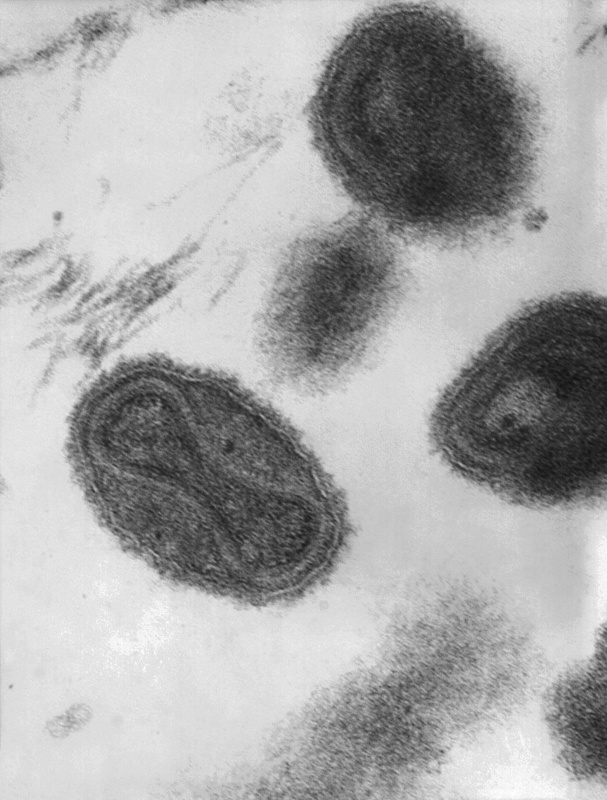 The dumbbell-shaped structure inside smallpox contains viral DNA. Scientists a few years ago found a Siberian family buried in a single grave dating from around 300 years ago. Their common grave suggested there had been an epidemic which rapidly killed the family, and smallpox was the most likely culprit. They successfully isolated some fragments of some of the genes of smallpox virus, but there was no evidence of intact genes, and thus no intact virus. And this was only 300 years old compared to the 30,000 years for the amoeba virus. Influenza is another virus which may have been around since early Egyptian times. Samples from the devastating Spanish influenza pandemic in 1918 have also provided an insight into how influenza virus fares over time. Back in 1997 tissue samples were taken from a body which had been buried since 1918 in the permafrost in Brevig Mission, Alaska. While scientists were again able to find many fragments of influenza virus genes, there was not a set of complete genes found. Piecing all those fragments together allowed scientists to synthesise the 1918 pandemic virus in the laboratory, but no intact virus was recovered from the body. Should we be concerned about other prehistoric viruses? The peksy little influenza virus that circulates every winter is currently a much greater threat than these ancient giants. Jennifer McKimm-Breschkin is Chief Research Scientist and Virology Project Leader at CSIRO. This article was originally published on The Conversation.